The committee invites submissions for LoF2oL covering substantial, original, and previously unpublished papers. Download Author Guidelines for Conference Proceedings. Note: Authors must follow Author Guidelines strictly; failing which the manuscripts would be rejected without review. Length limit 2.000 words (including the references). The fee includes conference program kits, meal during the conference, and certificate. Traveling and accommodation fees are excluded. Prof. Dr. Adler Haymans Manurung (Bina Nusantara University, Jakarta, Indonesia), expert in business law, capital market. Prof. Dr. Abu Bakar Munir (University of Malaya, Kuala Lumpur, Malaysia), expert in cyber law, intellectual property. Prof. Dr. Iur. 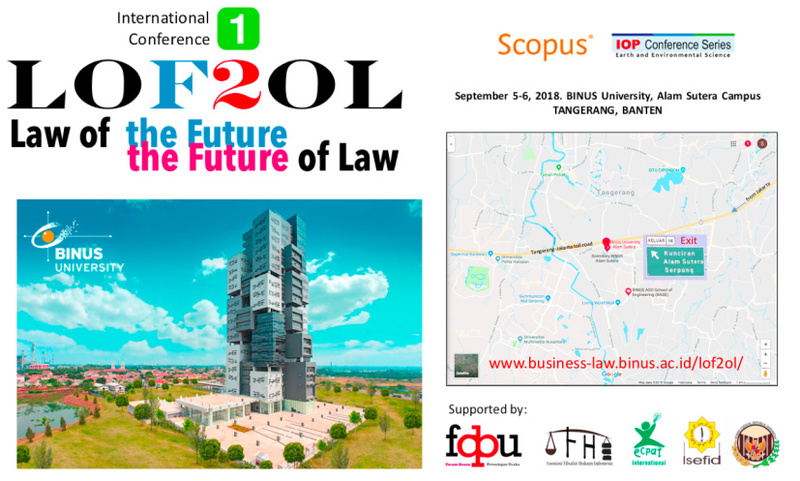 Stefan Koos (Bundeswehr University, Munich, Germany), expert in business competition law, consumer protection law. Prof. Dr. Michael Faure (Maastricht University, the Netherlands), expert in environmental law, international law. Prof. Dr. Adriaan Bedner (University of Leiden, the Netherlands), expert in legal sociology, legal research method. Prof. Dr. Michael Adams (University of Western Sydney, Australia), expert in corporate law, securities regulation. Prof. Dr. Ningrum Natasya Sirait (University of North Sumatera, Medan, Indonesia), expert in business competition law, international trade law. Prof. Soong Jenn-Jaw, Ph.D. (National Taiwan Chengkung University, ROC), expert in international law. Assoc. Prof. Dr. Abdurrahman Raden Aji Haqqi (University of Islam Sultan Sharif Ali, Bandar Sri Begawan, Brunei Darussalam), expert in Islamic banking and finance. Prof. Mateusz Jerzy Woinski, Ph.D. (Kozminski University, Warsaw, Poland), expert in human right law, criminal law. Patrick Keyzer, LL.M., Ph.D. (La Trobe University, Melbourne, Australia), expert in intellectual property. Dr. Shidarta (Bina Nusantara University, Jakarta, Indonesia), expert in legal philosophy, consumer protection law. Marie-Laure Lemineur, LL.M (ECPAT International, Bangkok, Thailand), expert in human right, child protection. Note: We feel more comfortable to be contacted by using WhatsApp.